FANCY’s production and R & D capabilities actively bring together its design and manufacturing department, and continually innovate using advanced production techniques to create value-added new products. A great example is the integration of negative-ion generating technology into its teppanyaki table, which in the process of cooking helps preserve nutrition and reduce grease-laden air – a novel concept-turned-reality that has garnered various patents internationally. Safety has always been FANCY’s top priority, hence our strict discipline on product quality. In the process of high-temperature cooking, food safety hazards, such as the release of toxic metals (lead, chromium, and arsenic, among others), could emerge and threaten people’s health. FANCY insists on meeting the highest quality management standards on steel plate processing, polishing, fabricating, piercing & punching, wiring, anti-corrosion, coating, grinding, testing, packaging, etc. The strigent quality management has not only enabled FANCY’s products to surpass client expectations, but also secured safety certifications from UL, NSF, CE, and ISO9001, as well as passed heavy metal solubility test to ensure no toxic substances are released during the cooking process. 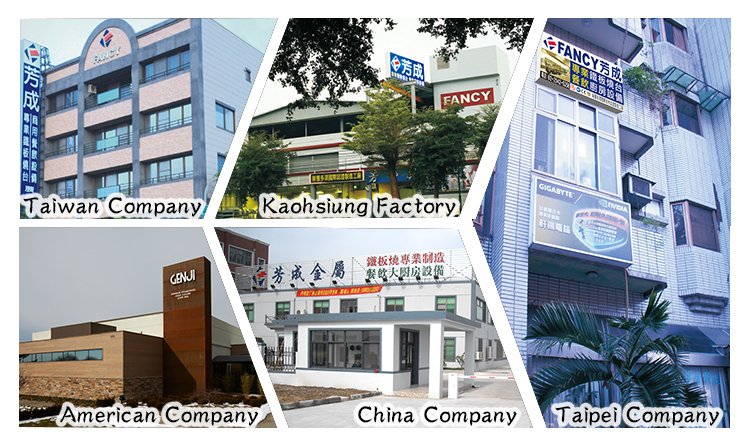 With continued effort, FANCY’s client base has burgeoned across Asia, Europe, and America, and FANCY is the only provider in Taiwan that exports commercial kitchen equipment and teppanyaki tables – the marquee product FANCY has become synonymous with – to as many as 40 countries worldwide. To provide quality service, FANCY has also established local branches or partnered with distributors in China, Singapore, and the US., and will continue to extend its reach globally. Consistency in quality and an ever-innovative attitude are the cornerstone of FANCY’s leading role in the industry. We will continue to commit our expertise and resources to research and development, putting our best foot forward and elevating the standard in commercial kitchen equipment. At the same time, we will also focus on developing eco-friendly products to do our part in preserving the environment, on top of providing the healthiest and safest cooking equipment possible.FANCY’s client base has burgeoned across global,FANCY is the only provider in Taiwan that exports kitchen suppliers and teppanyaki tables Manufacturers.